Organic Pecorino Sardo DOP (250g) - Our organic Pecorino is a semi-matured, excellent quality artisanal cheese made in the little town of Dolianove in the Province of Cagliari. Pecorino is one of Italy's oldest cheeses and features heavily in Italian cuisine! Pecorino Sardo is made with raw sheep's milk (giving it an authentic rural taste) and aged in ancient vaults. Parmigiano Reggiano DOP Aged 36 months (200g) - Artisanally produced at 1000m in the Appenine Mountains, this wonderful, aged Parmesan is made from raw cow's milk as all DOP Parmesan should be. Prosecco Colfondo DOC (750cl) - Produced in the Veneto region with organic farming methods, this Prosecco is biodynamic, natural and suitable for vegetarians and vegans. Sardinian Carasau Flat Bread (250g) - This wafer thin flat bread is light and crispy. It goes perfectly with cheese and antipasti. Sun Dried Tomatoes In Extra Virgin Olive Oil (314ml) - Our tomatoes are dried in the Calabrian sun and are naturally red from ripening. They have a beautifully intense taste and can be cooked or eaten fresh from the jar. Sicilian Shredded Aubergines (314ml) - These lightly spiced shredded Mediteranean aubergines are great served simply with some bread and are also a tasty addition to a sandwich, wrap or salad plate. 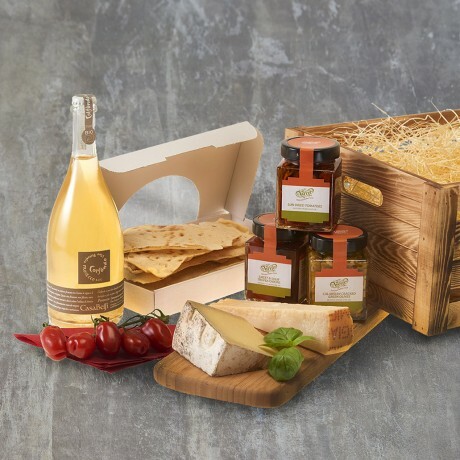 This delicious collection of Italian food and wine is presented in a medium wooden crate (the cheeses are packed in a chilled box first) which is wrapped in cellophane and tied with a colourful ribbon.